No other trading-card game aside from Magic: The Gathering has enjoyed such long-standing popularity as Vampire: The Eternal Struggle. White Wolf is proud to celebrate a decade of nocturnal politics and blood drinking with two special anniversary sets. 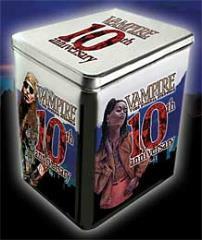 Each of these anniversary sets comes in a custom designed steel-alloy case that’s oversized to hold a sleeved VTES deck. Each set contains anniversary editions of a fixed selection of 90 previously out-of-print cards. Plus, each set contains copies of 10 new anniversary cards, for a total of 100 cards per set.